EunB of Ladies’ Code died Wednesday in a car accident that left two other members of the K-pop girl group in critical condition, police said. 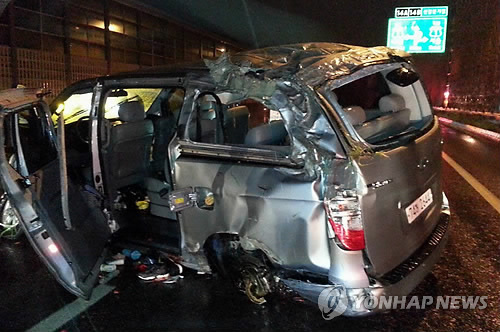 The 22-year-old singer, whose real name is Koh Eun-bi, was injured after the van she was in skidded off the road and crashed into a protective wall at around 1:32 a.m. on a freeway near Yongin, Gyeonggi Province. She was transferred to a nearby hospital but died despite efforts to save her. According to a police investigation, Koh was not wearing her seatbelt when the driver lost control of the vehicle. The fatal accident also left two other members, Rise and Sojung -- whose real name are Kwon Ri-se and Lee So-jung -- badly injured, while the two other members sustained minor wounds. According to the group’s agency, Polaris Entertainment, Kwon received a severe head injury and underwent hours of emergency surgery. Her condition was not revealed as of Wednesday afternoon. The group had been heading back to Seoul after participating in a KBS music show in Daegu at the time of the deadly accident. The five-member group is best known for the song “Pretty Pretty” from its second EP. Even before the group made its debut in 2013, Ladies’ Code enjoyed a fair share of followers, as two of its members, Rise and Sojung, had participated in popular TV audition programs.